Finally, Down to the Wire! Thanks Mirrix! This is the last picture I’ll take, before I finish the silver outside edging, on each strap, then attach the ‘front and center’ petal! The next pic will be a completed photograph. I can’t believe I have been Blogging about this Lotus SLN since last July, (although there were a few cuffs, one cell phone bag, a lot of earrings and a needle case, in between, lol). Thanks for hanging in there! Mirrix proved to be a real work horse! They said it could not be done! Well, not really. They hoped it could be done. A while back Fire Mt. 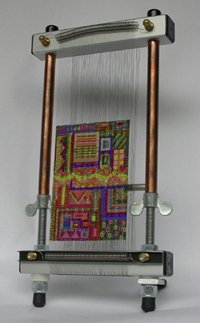 Gems asked me to create a bead tapestry on an eight inch loom. The picture was to be somewhere in their catalogue or on their site. I don’t remember where it ended up and if it even ended up anywhere. 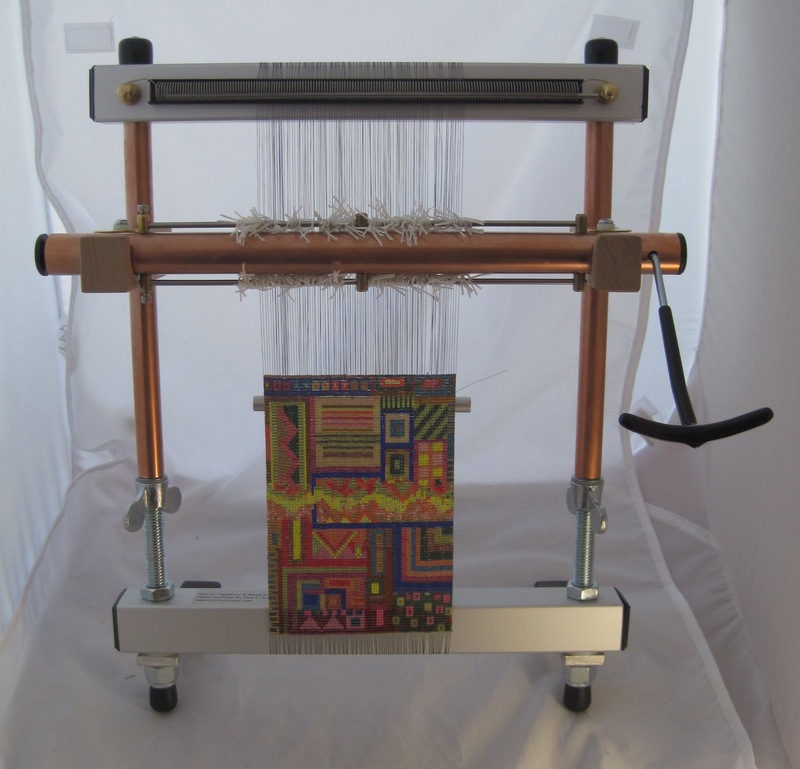 The other day I was asked if I could whip up a weaving on a loom with a shedding device (they realized they had not pictures of bead weavings on a loom with a shedding device). They needed it yesterday. I told them it would take me at least a month to weave such a piece and that I don’t have time to do that but I could possibly transfer the piece that was on the eight inch loom onto a twelve inch loom. They were shocked and pleasantly surprised. The transformation is below. Granted, this is not a functional setup. There are half the number of warps one needs to actually weave, but the piece is already woven and all they needed was it to look like the shedding device is functional. Yes, I am endlessly patting myself on the back for this. The reason I am sharing this is to show you that you can transfer a weaving from one Mirrix to the next or even from another loom to a Mirrix if the universe lines up correctly. I have to say this was even fun to do and I was pleased as can be with the results. Fire Mt. Gems is thrilled. 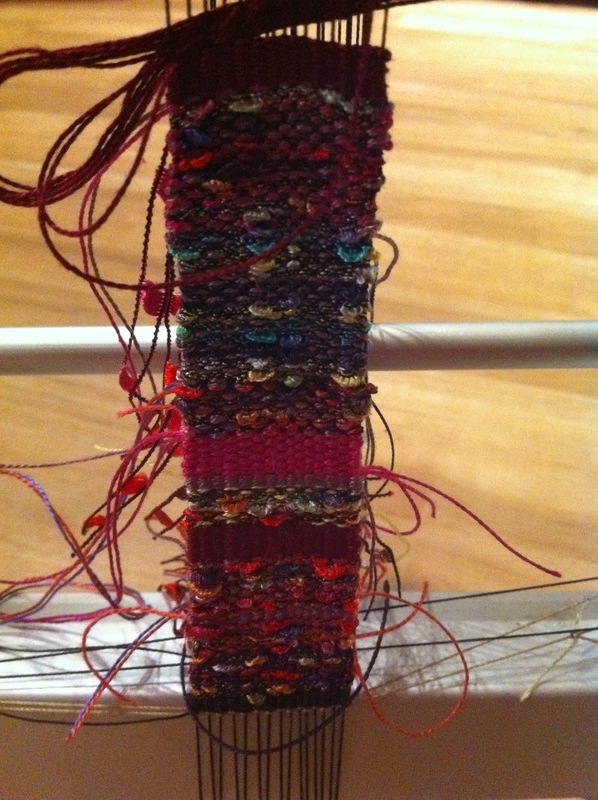 After choosing my colors I began to weave, making sure to keep the width of the piece the same. Up top there are a few places where the railroad yarn makes the piece look uneven. I will probably go back and fix this. If you aren’t careful the thicker parts of that particular yarn can end up on the edge and cause this unevenness. This piece needs to be 15 and a half inches long. I will make it a bit longer than this because the edges will be folded in and sewn down. I have been working on my ascent upwards, on the Lotus SLN. Here are a few pictures to show you my start. 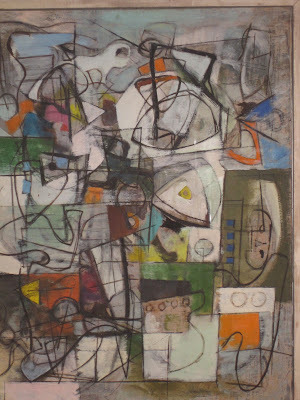 The picture above is an overall view. Besides the upper straps not being completed, there is only ‘one’ part missing, the petal ‘front and center’ of the Lotus. I will secure that into place, but wanted to get started on the upper straps. Here is a picture, back when I started this looming. 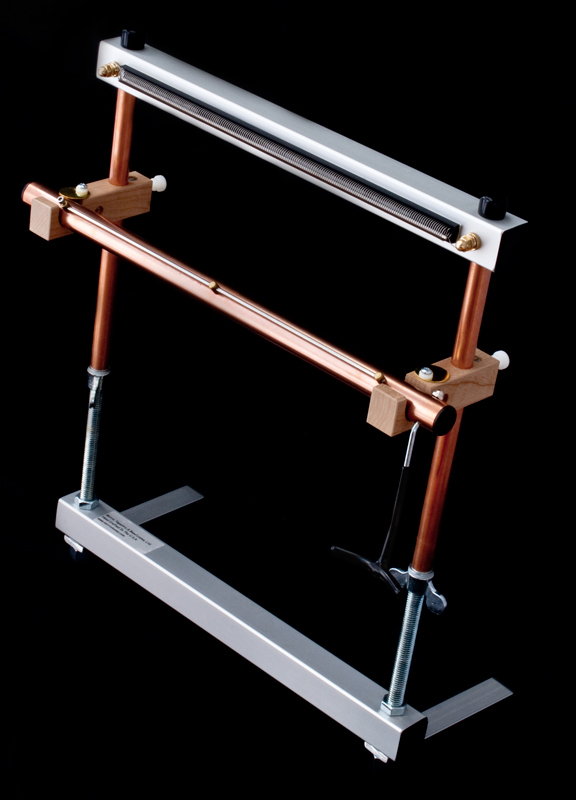 The Mirrix was the perfect loom for warping with so many warps, needing to control the tension on these warps, (Mirrix has wing nuts on each side to adjust tension), and using ©Weighted Warps so each warp is movable and able to decrease/increase anytime as I loom. Let me share what I planned and why I wanted to use the Mirrix with ©Weighted Warps. After sectioning off the ‘center and two straps’, I was now ready to begin some creative ‘cut outs’. 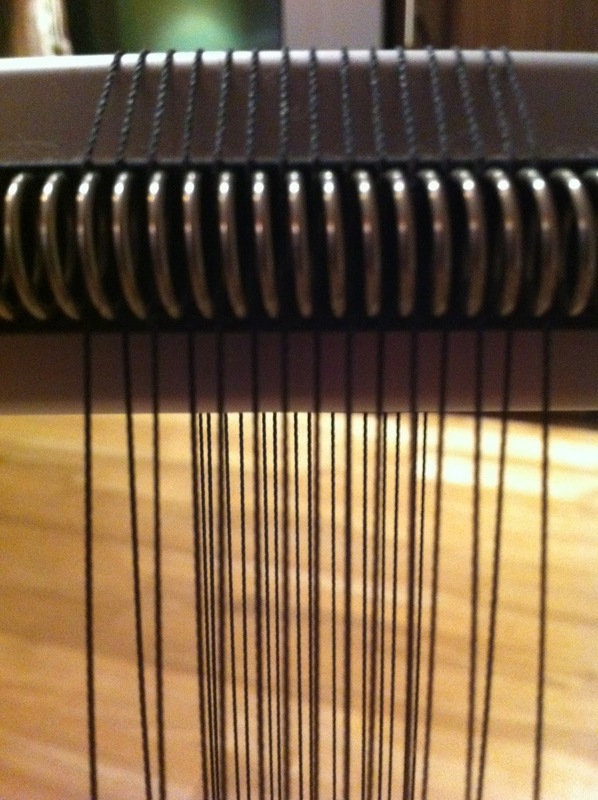 You can see the one cut out, I was able to create because the warps were not secured to the loom. The ©Weighted Warps allowed me to move any warp aside, include them in my rows of beads to indent and add them back in to close off the cut out again. All the while, each of the warps, secured to a ©Weighted Warp weight, were movable, had adjustable lengths and kept the tension for straight looming as well. Many lacy designs can be completed, using my ©Weighted Warp method, which I hope to get into more detail, later on. 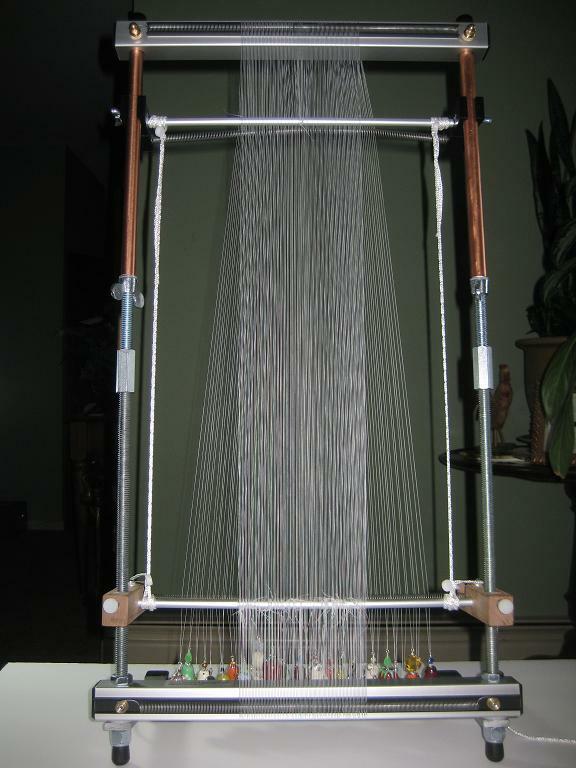 Much more to loom, as I ascend, which will include a graphed pattern I created. This pattern will splay out using 11/o Delica Silver Metallic beads and 11/o Delica Matte Black beads. 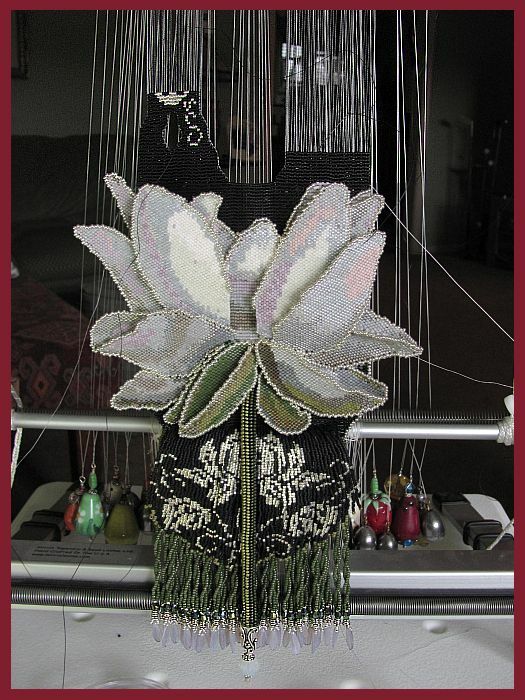 If you are interested in knowing more about my ©Weighted Warps, you can contact Venessa Hearn of Bead Up A Storm. 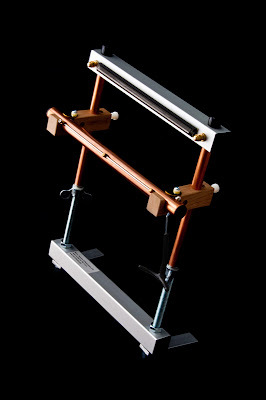 We have worked together to create the optimum ©Weighted Warp. 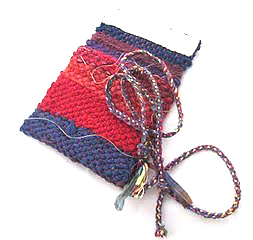 A purchase of these warps, from her shop, would include personal instructions and offer help on how to set them up or utilize them during your bead loom designing. You can also contact me for any specifics as well. 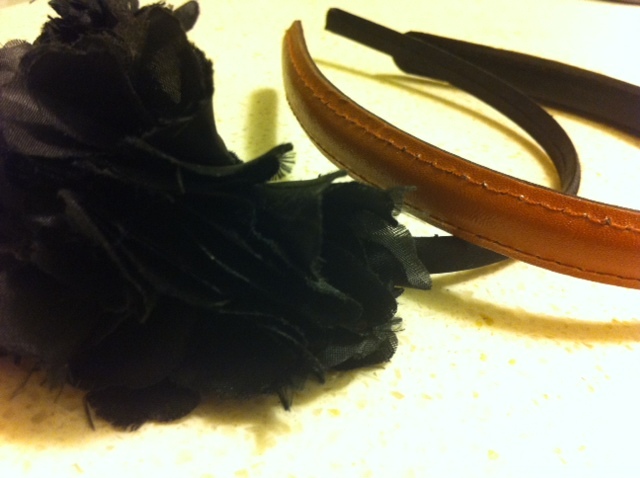 Also not mentioned yet, is the edging I will include to complete the upper straps. 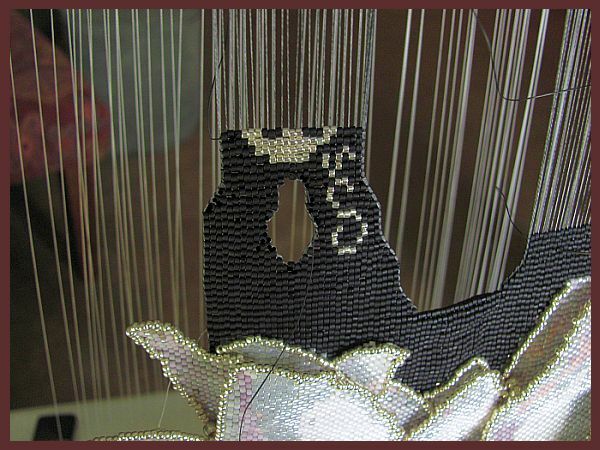 I will use the Silver Mettalic beads to line not only each outside edge, of each strap, but will also line the entire area of the cut out! I was in the mood to play with something new. Reached into my warp stash and came up with lovely rose colored (they are slightly different in color) very high-quality cotton warp. Rolled the two colors into a ball so I could use a double warp. Without three hands trying to manage those two tubes would have been difficult at best. Warped the loom. Put on shedding device. Used a ten dent coil every other dent. A twelve (six dent in other words) dent coil would have worked just fine. Make it as wide as you’d like. I have a lovely stash of already stripped “rags.” It’s actually beautiful first quality fabric but you can use rags. What a great way to use up cotton shirts, etc. that you don’t wear anymore. Or you can go to the fabric store and buy something you love. Stripping the fabric is a bit of pain and should probably done outdoors because it coughs up a lot of little cotton fibers you don’t necessarily want floating around your house or studio. 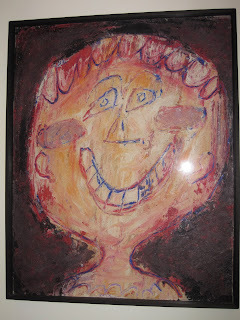 I did this stripping twenty years ago. I had to dig into that closet to find this stuff. So glad I saved it. In the past I’ve used these “rags” for table runners that last and last and last. The deal is: if you use high-quality warp and high-quality cotton rags your piece will last for a very long time. I’ve also made a couple of rugs that unlike commercial rag rugs I’ve purchased have lasted for twenty years after dozens and dozens of washings. It took me about four hours to: warp loom, weave and finish purse. Not bad for a whim. Below is the back of the purse after it was sewn together. This is the front of the purse. 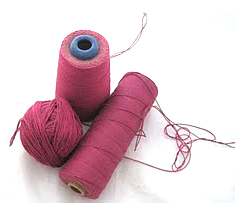 That’s the thread I was using to sew it up. I attached seam binding to both back ends to cover up the tied warp ends because I decided not to line the purse. Below finished purse with soon to be attached braided strap. This is the finished purse. I added a braid I had hanging around my studio for a strap. 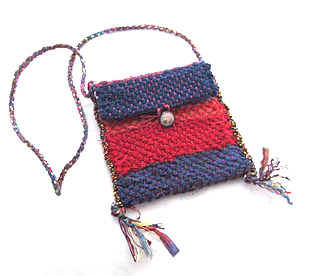 I sewed the braid to the outside of the purse and the embellished the edges on both sides of the braid with bead soup. The button is a hand-blown glass button I had hanging around. I certainly was using up leftovers on this piece! 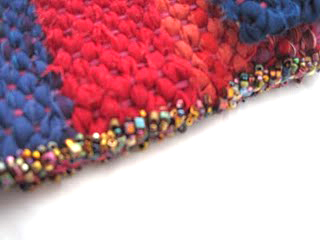 Below and below and below: detail shots of the bead soup edging. Become a blog follower, sign up for our newsletter, follow us on Twitter or Facebook . . . be our friend and your name will be put in a drawing to win this purse. The Little Guy Loom at his BEST! Big Sister looking really good. 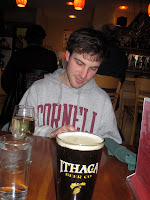 Spent the weekend at Cornell visiting Zach, my son. Managed to remember to have my camera on hand. Even remembered to use it a few times. An Eagle . . . I don’t know exactly which Eagle. I do know that he just sat on that branch even as we got closer and closer. 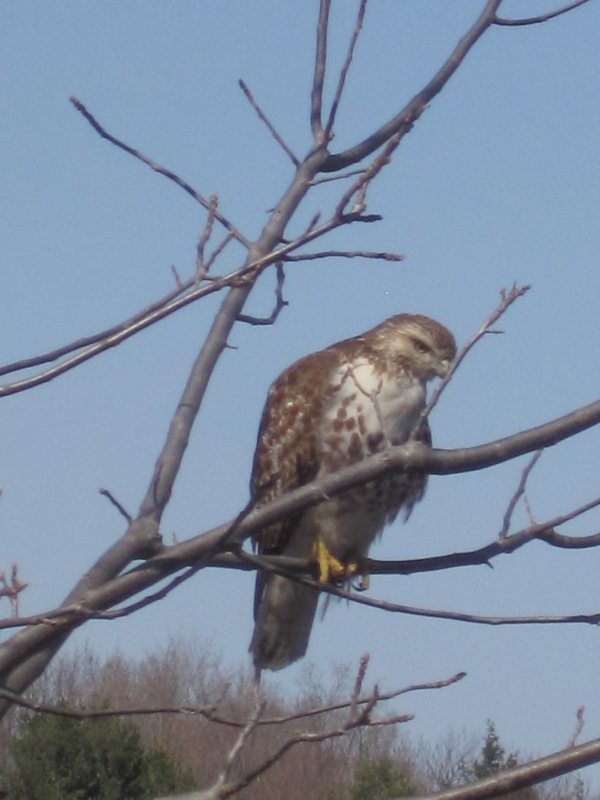 Finally, we were about five feet away. At that point he turned his back on us. Guess he wasn’t too afraid! He was so beautiful. What a gift. He lives on the Cornell “plantations”. I expect there is no hunting there so the wildlife feels pretty safe. Frank Lloyd Wright . . . but who really made it? Forget who this is . . . but I love it. I did manage to capture some of the amazing colors in this even though it was behind glass. Name the artist who painted this and we’ll give you a10% discount off your next Mirrix order. 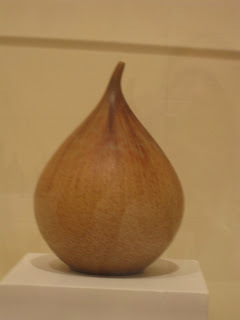 Love the shape of this. Can’t you just see that woven? Took a little tour of the campus art gallery. She was our favorite. Her back story: take a real model and put some kind of material over her in sections. Once it stiffens, remove. Then piece it altogether to make a mold. Then fill with some kind of polymer. Add hair and other details. The hair was sewn in one strand at a time. It must be weird to know your exact likeness is sitting in a chair being stared at by the likes of us. She really does look real. Eye balls are glass and when you are close to her you feel like she’s going to slap you because you are staring at her. And finally a nice meal at the Moosewood Restaurant with Zach! And please remember to follow us on the this blog. We like feeling loved!!! I still wear handbands sometimes, but haven’t found one I really love in quite some time. I’ve ordered some headband blanks (plastic, let me know if you know where I can get thick metal one in bulk) and have started a weaving that’s a little more than an inch thick. I’ll keep writing through the phases of this project! Now for the finished tapestry. I’ve taken a photo of the back so you can see how I finish my tapestries. I never sew a solid piece of material to the back because over time that can distort the piece. 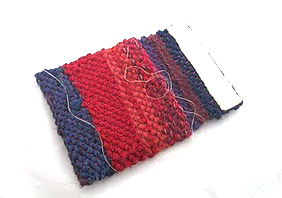 The strips hold in stray pieces of yarn and give it a more finished look. I usually attach a strip of velcro to the top and the accompanying piece to a wooden strip which attaches to the wall. Because this piece is so small, I didn’t bother to do that although I might later. I’ve used bead soup to embellish the top and bottom of the piece. I covered up the “house” with bead soup and hung glass leaves around it. This piece is called “Shrine Two”, the second in a series of very simple handspun pieces embellished with beads, glass and metal charms. 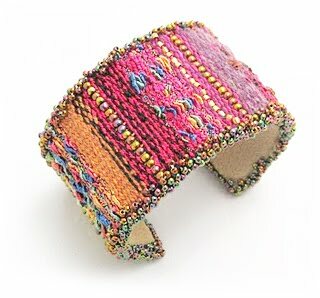 Quick and fun to do and a great way to play with handspun without getting very serious.